Getting home from work safely and in one piece is something that is easy to take for granted. Some 1,710 people were killed in the 12 months leading up to the end of June 2017, according to the latest road casualties figures from the Department for Transport. That’s a drop of five per cent on the same period a year earlier but it doesn’t change the fact that at least four people die on Britain’s roads on average every day. Clearly, there’s still much to do when it comes to making UK’s roads safer and to play our part, Fuel Card Services got involved in the Shell Group’s annual Safety Day. Each year, Shell Group employees from around the world engage in a day focused on a key area of road safety and in 2018, it was risk normalisation – high risk activities that we do anyway, most of the time without thinking, such as driving home after a long day at work. These are activities that may be risky in the first instance, but because we don’t get harmed doing them, we perceive them to be less risky the more we do them. For example, remember how intimidating the act of driving was when you got behind the wheel for the very first time? It’s likely that you don’t even think twice about it these days. 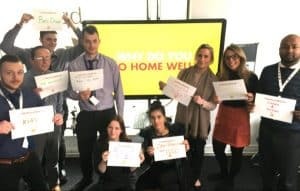 To mark this year’s Safety Day, Fuel Card Services staff met to discuss how they could mitigate risk normalisation by recognising risky habits and intervening when they see others doing the same. Participants identified and intervened on risk normalisation to help ensure everyone in the organisation was able to ‘Go Home Well’ at the end of their working day. 2018 was the first time Fuel Card Services took part in the annual Safety Day and saw a number of offices discuss risk normalisation, how to recognise and prevent it and what they ‘go home well for’. You can see some of the suggestions from some of our staff based in the Burnley office in the photo at the top. Visit http://www.shell-moh.com/safety-day-events for details on previous Safety Day events.